Halloween Slime - Easy 3 Ingredient Recipe! Halloween is one of our favorite holidays. It’s actually something our toddler is really excited for this year (because….candy!). But he also gets excited for all the pumpkins, halloween decorations and fun costumes. 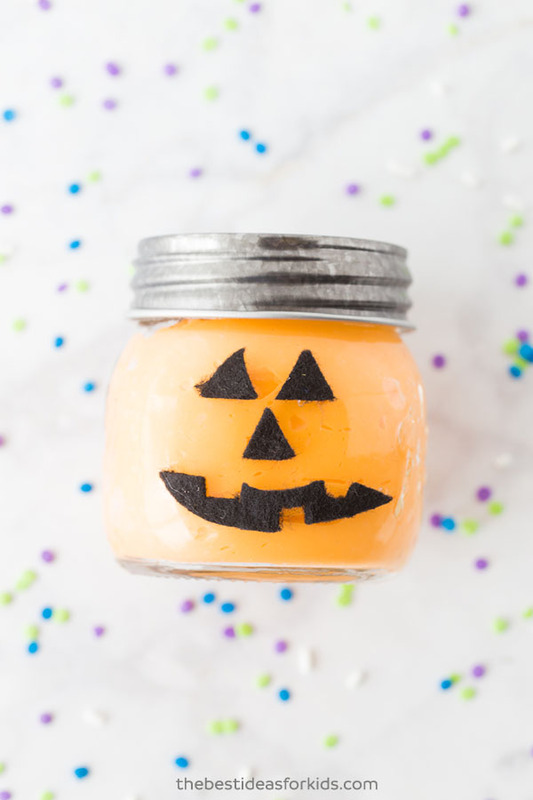 We know the candy can be overwhelming for some kids to receive so today we’re sharing a non-candy Halloween treat idea with this Halloween slime. You can make a large batch of one kind or make them all! 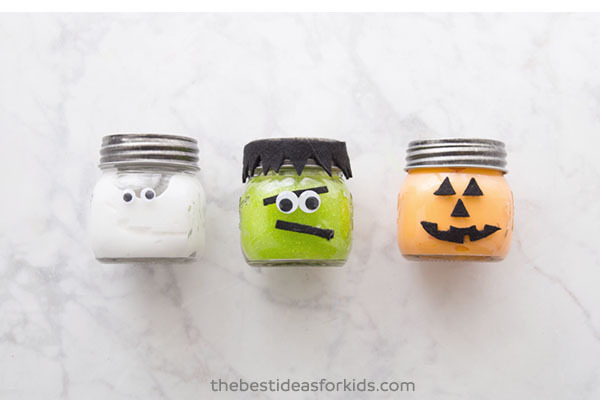 Either way, kids will love receiving these adorable Halloween slime jars. We made pumpkin mason jars a few years ago and they’ve been a huge hit. That’s why we thought – why couldn’t we make pumpkin slime jars?! Such a fun idea to fill the color of the mason jar with the slime! And if you’re not the best with felt, you could stick to just making the ghost slime jar. We love easy! But how can you resist that Frankenstein jar? It may be the cutest Halloween craft we’ve ever seen. 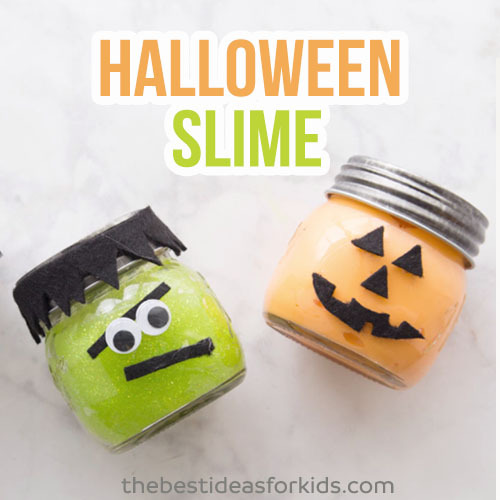 Halloween Slime – an Easy Slime Activity! 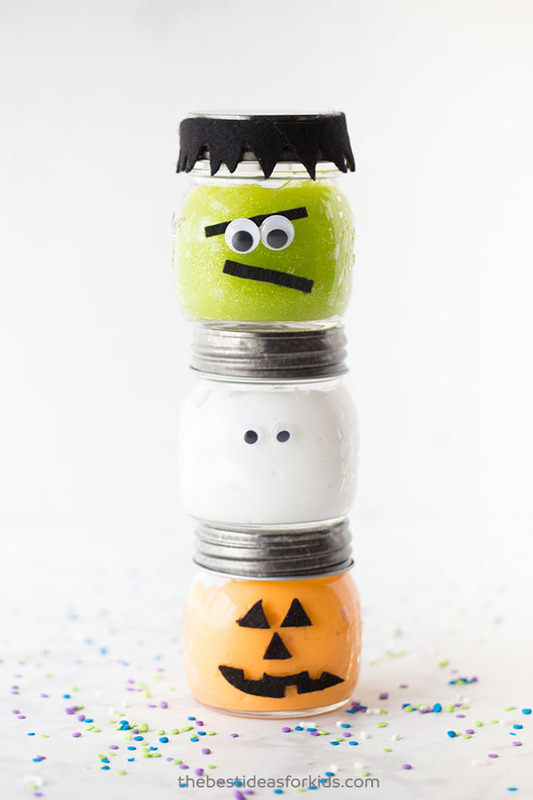 Now meet our 3 Halloween Slime Jars that we’ll walk you through how to make. First is our pumpkin slime jar – made with orange slime inside and black felt for the facial features! Next is our Frankenstein slime jar – this guy is seriously the cutest! He may be our favorite mason jar craft yet! (And we’re pretty partial to these Trolls mason jars if you haven’t seen them). And finally (the easiest one!) a simple ghost slime jar. 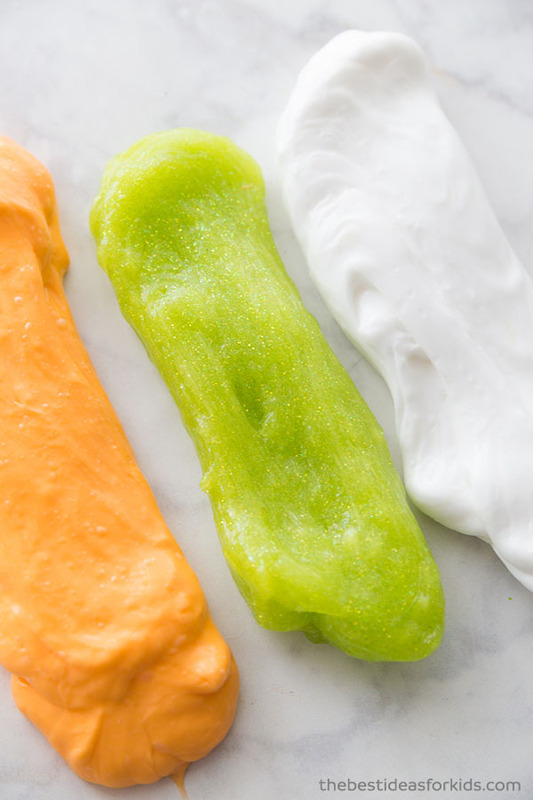 Here are the three slime colors we made stretched out for you to see them. 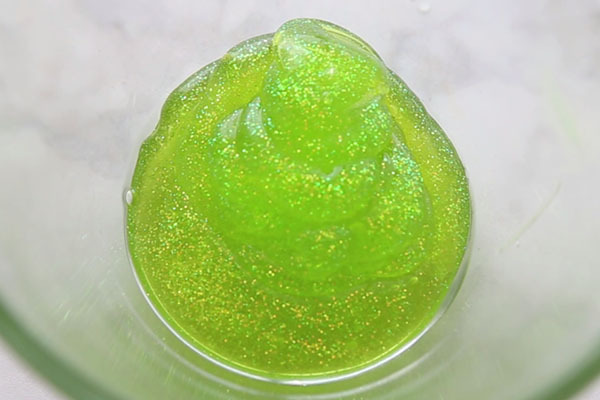 Now let’s get into the details on how to make this Halloween slime! 6 ounces of Elmer’s glue– we used white (2 bottles) and glitter green and repeated the recipe 3 times. Note: we made this with Elmer’s glue. It is recommended you do not substitute with other glue as the make-up may not be the same and the recipe may not work (especially Dollar store glue many people report having problems using this). Orange food coloring for the pumpkin slime jar *Note: the food coloring may stain, use wax paper to cover your table when playing with it and avoid contact with anything you do not want stained. 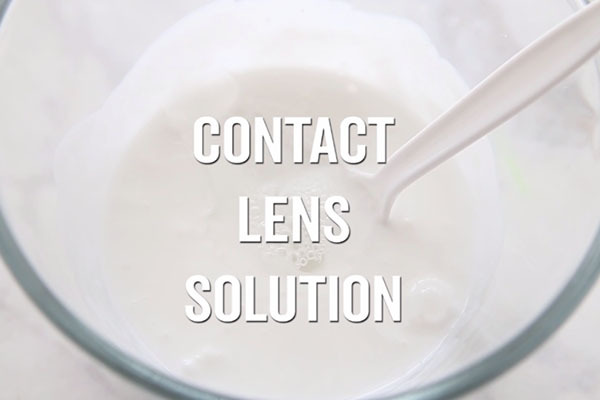 1½ tablespoons of Contact lens solution. **Important: your brand of contact lens solution must have boric acid in the ingredient list. This is what interacts with the glue to form the slime. 2. Pour 6 oz of your Elmer’s glue into the bowl. 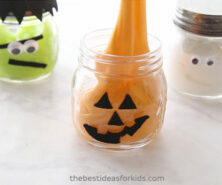 Use white glue for the ghost and pumpkin slime. 3. 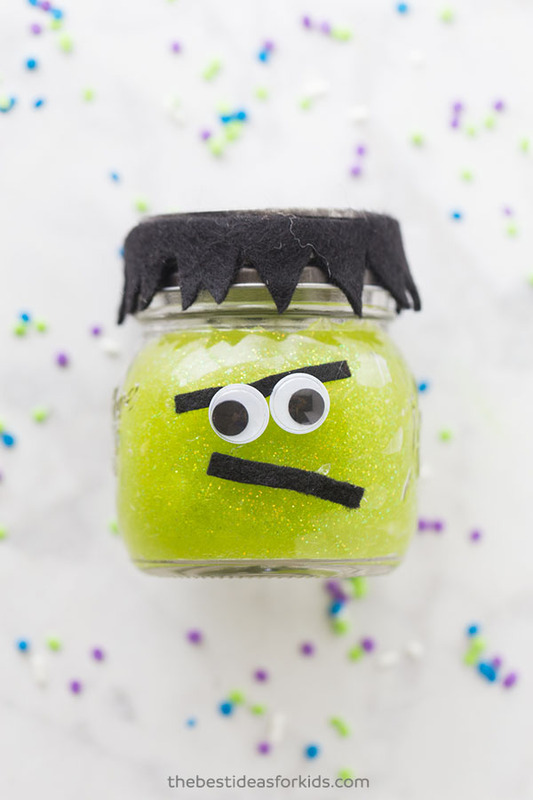 Use your green glitter glue for your Frankenstein slime. 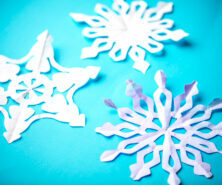 You could also substitute the green glitter glue for white glue with green food coloring. You can save on glue by getting the large gallon size if you plan on making a large batch. 4. 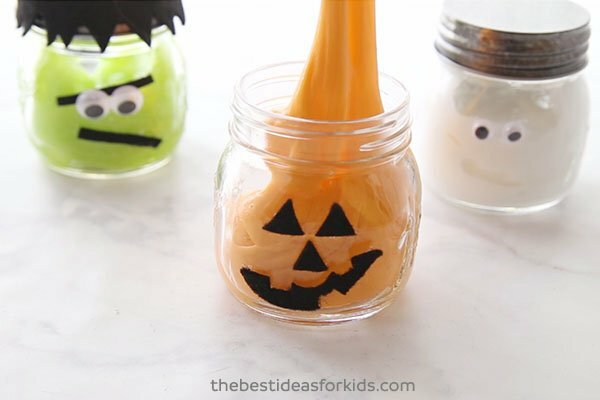 Mix in orange food coloring to make orange glue for your pumpkin slime. *Note: the food coloring may stain, use wax paper to cover your table when playing with it and avoid contact with anything you do not want stained. 5. 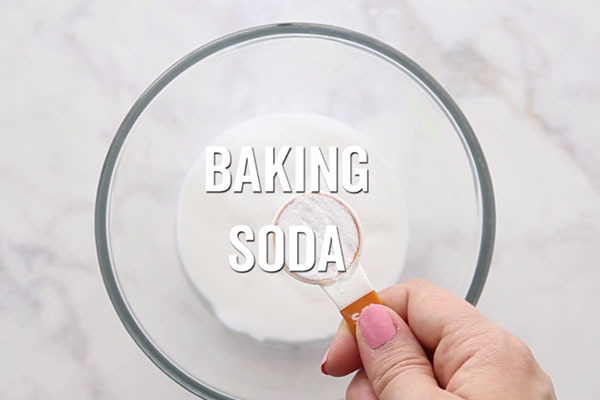 Add your 1/2 teaspoon of baking soda and mix in thoroughly. Also add 2 TBSP of water here and mix. 6. Now add in your contact lens solution. We recommend adults do this part. Reminder: your contact lens solution should contain boric acid or your slime will not form. Start with half of what the recipe calls for and mix. If your slime is not forming enough, add in the rest. If you find it is still too sticky you can add a bit more. 7. Now mix until your slime forms and begins to harden. Knead for quite some time with your hands. You may be surprised how much you need to knead to really make the slime form. If it’s not the desirable consistency keep kneading. If you find it to still be too sticky, add a bit more contact lens solution. 8. Now add your facial features to your mason jars! We used googly eyes for the ghost slime jar. We cut out a pumpkin face with black felt for the pumpkin jars. And we used black felt and googly eyes for the Frankenstein jars. 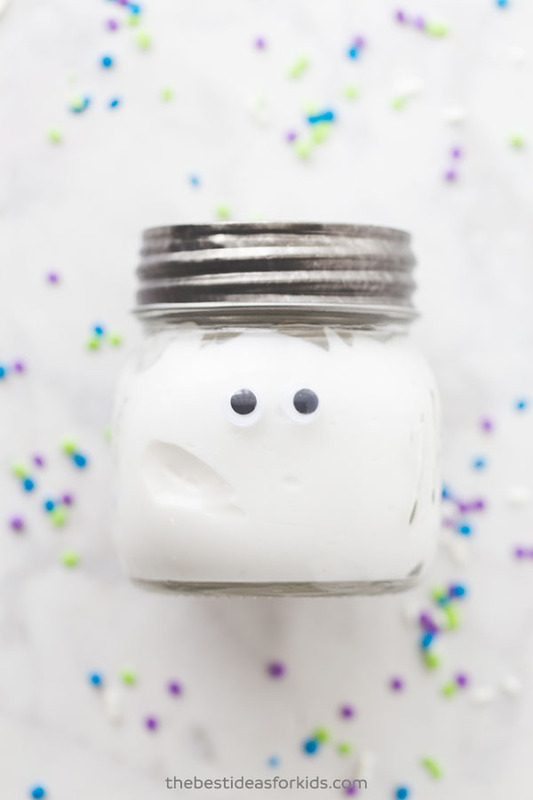 Glue to your mason jars using hot glue (adults only) or glue dots for the googly eyes. 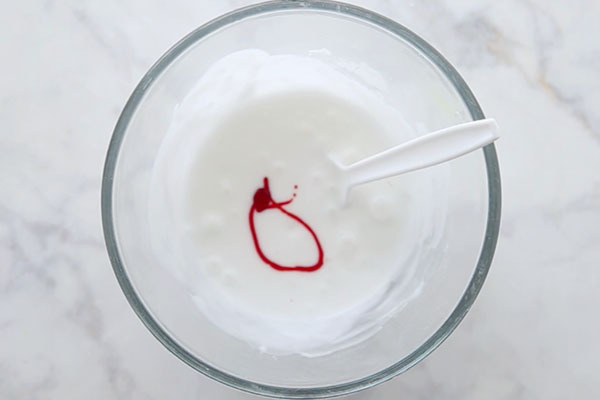 This recipe was adapted from our Unicorn Slime recipe. Now you can play! 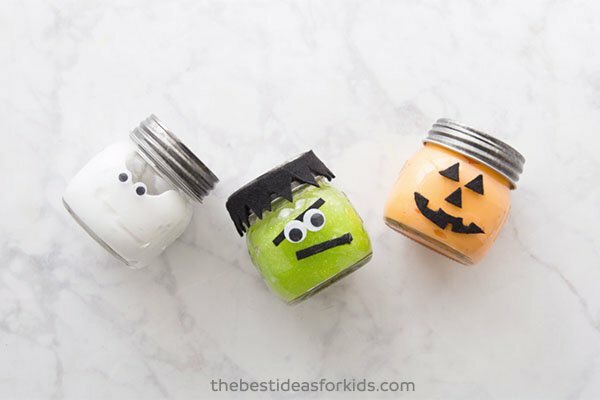 Give these as gifts or simply have the kids play with their Halloween slime! These would also be perfect for a Halloween party. Then seal up the jars when you’re done for safe keeping and storage. -1 bottle of Elmer’s glue 6 oz – we used white (2 bottles) and glitter green and repeated the recipe 3 times. Note: we made this with Elmer’s glue. It is recommended you do not substitute with other glue as the make-up may not be the same and the recipe may not work (especially Dollar store glue many people report having problems using this). -1½ TBSP of Contact lens solution. **Important: your brand of contact lens solution must have boric acid in the ingredient list. This is what interacts with the glue to form the slime. Get a bowl to mix your slime ingredients in. Pour 6 oz of your Elmer’s glue into the bowl. 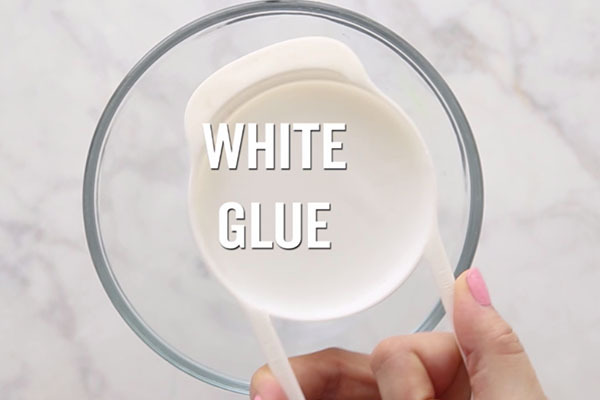 Use white glue for the ghost and pumpkin slime. 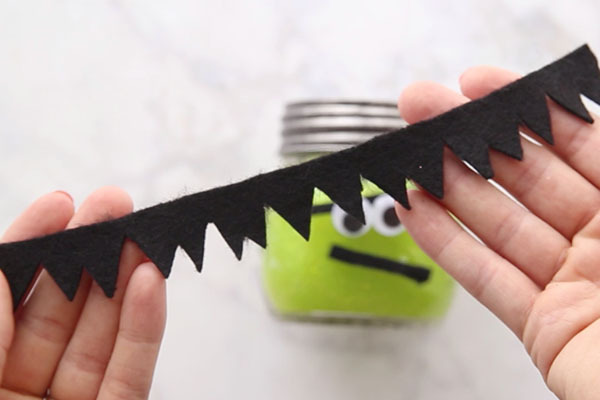 Use your green glitter glue for your Frankenstein slime. Mix in orange food coloring to make orange glue for your pumpkin slime. Add your 1/2 TBSP of baking soda and mix in thoroughly. Also add 1 TBSP of water here if you want a stretchier slime. Now add in your contact lens solution. We recommend adults do this part. Reminder: your contact lens solution should contain boric acid or your slime will not form. Start with half of what the recipe calls for and mix. If your slime is not forming enough, add in the rest. If you find it is still too sticky you can add a bit more. Now mix until your slime forms and begins to harden. Now knead with your hands. You may be surprised how much you need to knead to really make the slime form. If it’s not the desirable consistency keep kneading. If you find it to still be too sticky, add a bit more contact lens solution. Now add your facial features to your mason jars! We used googly eyes for the ghost slime jar. We cut out a pumpkin face with black felt for the pumpkin jars. And we used black felt and googly eyes for the frankenstein jars. Note: this recipe does not contain borax. However, it is still considered a science experiment and safety precautions should still be made when creating slime. By making this slime, you agree to our site terms which you can read here. 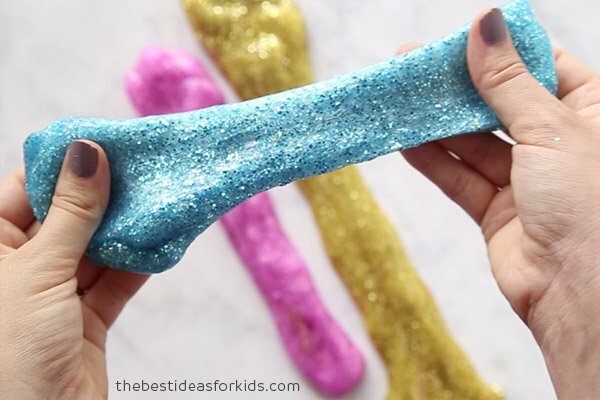 For more fun slime sensory play, try making this glittery Unicorn Slime. 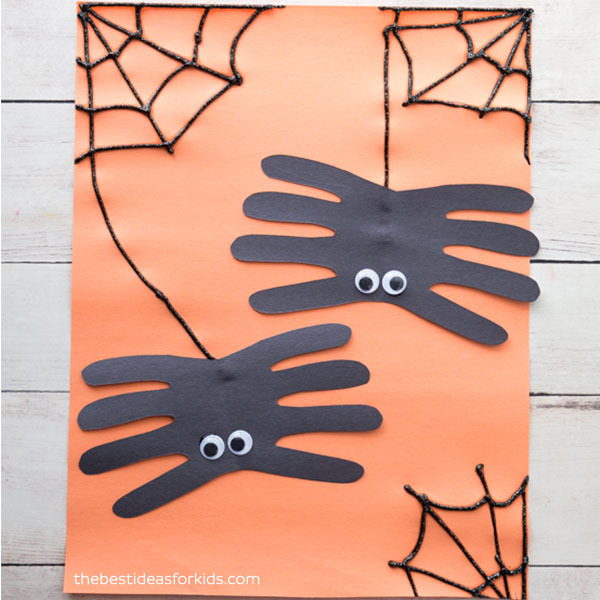 And for a fun Halloween craft idea that uses glue – these spider handprints are too cute! 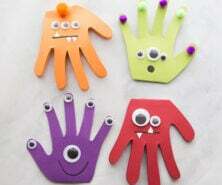 Kids will love tracing their hand and making the webs with glitter glue. Hi! Up above you have 1/2 teaspoon of baking soda, and down below you list 1/2 tbsp of baking soda. Which is correct? Is it 6 oz of glue per jar? If I needed to make 10 jars, I would need 60 oz of glue? Thanks! Yes one batch will fit in one jar if or 2 small baby jars. Would a 4 ounce jars be big enough to fit the Frankenstein face? You can definitely do it on smaller jars and just adjust the sizing of the face to match (smaller eyes, etc)! Thank you! One more thing…..what size jars are those that you used? 6oz? I want to order online. Thanks!!!! We used 8oz but 6oz or 8oz would work well! Hi there, these are so cute! You mention 6 oz bottles of glue- do you mean 4 oz? The glitter glue bottles come in 6oz. The white glue we prefer to buy the gallon size and then we measure out 6 ounces. 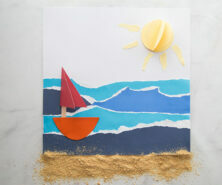 The recipe is for 6 ounces of glue – either glitter glue or white school glue. Hope that helps! hi I would like to make 24 batches of this for a classroom party. Have the kids each make their own. Is the recipe you list for ONE batch? one batch to fit the small jar? Hi Natalie – the batch will easily fit in a small mason jar. If you use small baby jars instead you could fit 1 batch in two small baby jars. Hope that helps! Hey um I don’t know if you can answer this but if make 50 batches for Halloween and do you know how many jars I would need if I use the same size you did. These are small mason jars so you’d only fit about 1 batch in each. If you want to be able to fit more you could use smaller mason jars (like mini ones I’ve seen at the dollar store). Its a brilliant idea. Thanks for sharing. I will visit Michaels for some craft tools So i can change the theme of these jars. I have a class party I’m doing and have 30 kids. I’m needing to know how many baby jars this recipe will fill (if known)? You could probably fit one batch/recipe in two baby jars. This batch fits a small mason jar probably approximately double the size of a baby jar. Hope that helps! This looks like the perfect craft for a 1st grade class to do at their halloween party. We have 15 students in the class, do you know how many jars each batch makes? Hi Adina, it depends on your jar sizes. These are small jars but larger than baby food jars so 1 batch would fit. If you used baby food jars you may be able to split one batch into two jars. Hope that helps! Hello, I love this idea and I’m planning on doing it with my 4th graders. Where did you get the clear round Mason jars with lids? I need 30 of them. Thank you for your help.